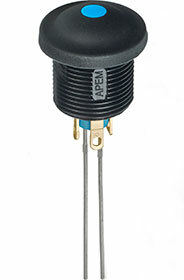 Apem’s ‘I series’ range of pushbuttons is now evolving with the new IX series, designed to meet demanding markets. The IX series combines the high qualities of the IP and IA series with a backlit switch and 12 mm diameter, compact bushing and flexible elastomer membrane actuator. The IX series is recommended for harsh environments in markets such as material handling, agriculture machinery and defence. It is sealed to IP67 and IP69K, and can be supplied illuminated or non-illuminated, with marking on request.